Replaced saniflo and outside cast iron drain pipes. Very polite workmen. Explained everything they had to do. Cleaned up after themselves. Latent Heat recently fitted a new combi boiler for me and I could not be more happy with the service I received. They took the time during the initial consultation to explain everything and make sure the right boiler was selected for my flat. David talked me through exactly what work would be done and how they would do it, ensuring there were no surprises along the way. The clear experience and expertise shown by David during this consultation was the reason I decided to go with Latent Heat. The engineers who came to fit the boiler were very professional and courteous, making sure they kept me informed of the progress throughout the installation. All round great service, cant recommend enough. We hired Latent Heat to completely strip out our entire heating system and install a new system in new locations throughout in our house. We also had work carried out to the water services, including a new outside tap. Having spoken to various companies, we were most re-assured by David and Hugh’s professionalism. They understood what we were trying to achieve and their commitment to delivering the work was never in doubt. They were realistic about what was required and never over-promised on anything. The tradespeople turned up on time, when they said they would and left the house habitable for our return. This was a really high quality install with no major over-runs on time and no hidden costs. I genuinely believe I couldn’t have gotten better value anywhere else. We called a number of companies including Latent Heat to quote for a boiler. The engineer said it wouldn’t be the cheapest or dearest quote but probably in the middle. 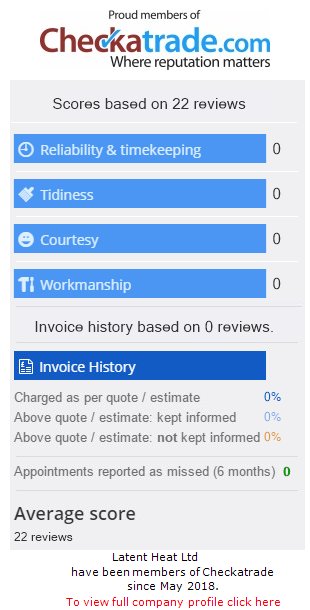 He provided us with what looked like a very competitive quote and a choice of boilers at different prices, which he left with me and went on his way. After a very quick conversation with my wife we chose this company to do the work. They carried out the boiler change efficiently and were very courteous and clean, keeping us informed at every stage. They also put in new controls which we were delighted with. We definitely chose the right company to go with, ‘Latent Heat’ made us feel at ease with their efficiency, professionalism and over all service. I would fully recommend ‘Latent Heat’ to anyone in need of their services. I thought I would write to thank you for the work your company carried out for me recently. As you already know, I was given a quotation by another firm for many thousands of pounds for work that was simply not necessary. I was delighted with your firm and the approach from your staff who I found to be friendly, professional and easy to talk to. The solution was first class, considerably cheaper than the other firm and carried out without fuss or upheaval and in good time as agreed. I would have no hesitation in recommending your firm to friends and family.